Synthetic peptide corresponding to Mouse HB9/HLXB9/MNX1 aa 330-380. WB: MOLT 4 cell lysate; IHC-P: Mouse pancreas tissue. Our Abpromise guarantee covers the use of ab92606 in the following tested applications. IHC-P: Use at a concentration of 5 µg/ml. WB: Use at a concentration of 0.5 - 2.0 µg/ml. Predicted molecular weight: 41 kDa. Putative transcription factor involved in pancreas development and function. Expressed in lymphoid and pancreatic tissues. Defects in MNX1 are a cause of Currarino syndrome (CURRAS) [MIM:176450]. The triad of a presacral tumor, sacral agenesis and anorectal malformation constitutes the Currarino syndrome which is caused by dorsal-ventral patterning defects during embryonic development. The syndrome occurs in the majority of patients as an autosomal dominant trait. Immunohistochemistry analysis of HB9/HLXB9/MNX1 expression in formalin-fixed, paraffin-embedded Mouse pancreas tissue using: an isotype control (1) or ab92606 at 5µg/ml (2 and 3). ab92606 has not yet been referenced specifically in any publications. Publishing research using ab92606? Please let us know so that we can cite the reference in this datasheet. Can you please let me know what species and applications are QC tested for each new lot of ab20670 and ab92606? Thank you for contacting us. Each new batch of ab92606 is QC tested in WB on MOLT4 cell lysates. 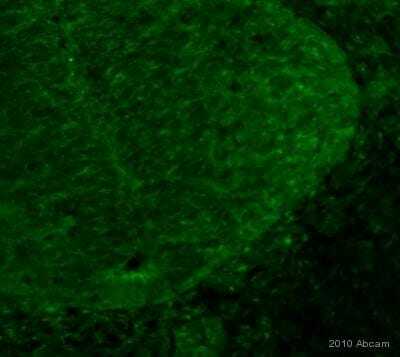 For ab20670, each batch is tested in IHC-Fr on E11.5 mouse embryonic brain. I hope this helps, please let me know if you need any additional information or assistance. That is a perfectly acceptable range for short term storage. Can you let me know what storage condition this product ships to customers? (room temp, dry ice, etc… ) Also can you send me a copy of the COA/COC for any lot? Abcam ships this product at approximately 2 - 8oC with ice packs. A Certificate of Compliance is available for each lot. I hope this information is helpful to you. Please do not hesitate to contact us if you need any more advice or information.